Rooms, services Pensiunea Diana Băile Felix is offering 11 tasfefully furnished, nice rooms for those looking for a place to stay at in Baile Felix. In case you are arriving by car, you will have the opportunity to leave it in an own parking lot of the pension without paying any additional costs. You can browse the Internet via wireless connection (WiFi) available at the pension. An exact and detailed list of equipment in the rooms and of the services provided by Pensiunea Diana Băile Felix you will find on the information sheet below and on the information sheet of the individual rooms, including any applicable additional fees. Arrival, opening hours The earliest time to check in at the pension is 14:00, the latest time to check out is 12:00. The personnel can speak English, Romanian, Hungarian and German languages. The rating of Pensiunea Diana Băile Felix is 9.4 from the maximum 10, 15 based on actual and valid guest ratings and reviews. "Proprietarii pensiunii excelenti - Vom reveni cu placere." 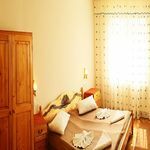 "curatenia lasa de dorit, miros ff urat in baie"
"exista spatiu de joaca pentru copii gratar loc de servire a mesei"
"senki nem zavart és kedves a személyzet"
Based on the reviews and comments of actual guests, the services of the Pensiunea Diana Băile Felix have received a high rating of 9.2/10.